Messing around with the fish finder to find great fishing spots and adjusting the settings is just not something anglers always have time for. The Lowrance Elite-9 Ti fish finder certainly eliminates the need to focus on all these distractions and get down to what you do the best. The Elite-9 features CHIRP technology and all of the top range software upgrades that have not been included in many of the smaller models. These are ideal for saving you time and money to get on the water and enjoy your trip. The Elite-9 features 2D CHIRP sonar working on the frequencies 50/83/200 kHz. It has a maximum depth range or around 1000-feet. The addition of the StructureScan sonar that has already been included offers SideScan and DownScan Imaging. The Structure also operates on multiple frequencies of 455/800 kHz. The DownScan option features a maximum depth of 300-feet, while the SideScan has a range of 100-feet. No Ice Machine upgrades have been included in the package, leaving us to assume that the fish finder has already been equipped with this upgrade to make it possible to work in cold weather temperatures and especially in the Arctic ice. The Lowrance Elite-9 features a massive 9-inch display system with multiple buttons on the sides that can be used to operate the settings. However, these setting can also be operated on the touchscreen display. The screen resolution is around 480 x 800 pixels and an additional backlight has been added with a toggle button to turn on and off. All of the most important stats can be seen on the display system and they can also be adjusted using the touchscreen to enlarge the stats or to view them from in the sidebar. Advanced Signal Processing is once again added to this model, enabling the user to focus on fishing while the system automatically adjusts the settings based on the collected data. With some of the older models, upgrading your maps and software always seemed to be quite a hassle, but the Lowrance Elite-9 comes with wireless connectivity that enables the user to connect to any Wi-Fi connection. The GoFree app included in the package enables users to plot their very own waypoints and share this with other app users as well. Additionally, all of the upgrades can be stored a MicroSD card. However, the user is responsible for purchasing their very own MicroSD card. The Lowrance Elite-9 Ti fishfinder features a highly sensitive GPS antenna and more than 3000 maps and charts of US lakes, rivers, and the US coastline. Users have the ability to plot up to 1000 waypoints and save hotspots of areas abundant in big fish. As we have mentioned before, this can be shared over the app when connected to the internet. Insight Genesis has also been included and this allows the user to create custom maps of areas and save them for future use. Many of the upgrades for the other models like the Elite-7 has already been included. However, the LakeInsight, NauticInsight, and Navionics HotMaps must be purchased and upgraded separately to expand the library. The Lowrance elite-9 is certainly one of the best if not the best fish finder created by the Lowrance company. No doubt, that is expensive, but when looking at the design, this all makes sense. The screen is overly large and might be hard to store , but never will you miss any fish icons. The entire device is waterproof and has been tested to have a rating of IXP7. This means that the rain will not even do the slightest damage. The addition of the LED backlight that can be toggled is ideal for those looking to go fishing at night. It also brings versatility to the fish finder since certain fish are more active at night or during bad weather conditions. The multi-window feature also makes a welcomed return, enabling the user to see multiple stats and features simultaneously while cruising on the water. Unboxing it and playing with the features are fun, but this fish finder certainly excels when it is used on the water. The clear screen makes it easier to see any fishing icons and since it can be used for ice fishing, it is extremely functional. Saving multiple hotspots are great for revisiting the newly found area the following day as well. 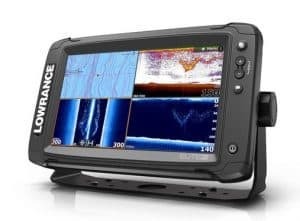 Like many Lowrance fish finders, the instructions are quite tough to read and understand, but if you have basic knowledge of how to use and set up a fish finder, this one should not be any different. The additional 2-inches on the screen is definitely a massive upgrade and the TotalScan transducer enables you to fish on multiple different frequencies and never miss anything passing by. Lowrance has put a lot of time and effort into perfecting their GPS system and this certainly shows when using this fish finder. The GPS is fully functional and allows you to plot multiple waypoints, but the Insight Genesis feature stands out for us in terms of allowing you full customization over your maps. The antenna seems to live up to its reputation of being one of the most sensitive available on the market today. One thing we would have like to see would have been the addition of map upgrades at a lower price. Since you are able to upgrade many of the maps and expand your library, it is worth noting that these are all done on the app and can be quite expensive as well. Nevertheless, the internet does enable you to share your custom maps and hotspots with some of the other app users instead of them also purchasing these maps. The Lowrance Elite-9 certainly stands on top of the hill when it comes to fish finders in the Lowrance product line. It is one of the most expensive and has all the features and more than you would find in some of the lesser models. The closest competitor to the Elite-9 in the Lowrance product line is the Elite-7, which is a little smaller and slower. See our Lowrance Elite-7 Ti review. As one of the top fish finders on the market, the Elite-9 does not have many competitors in the same price range. One of the main competitors is the Simrad NSS7 evo2 Combo Multifunction Display Insight with the same-sized screen, but it looks a little more stylish and includes a stand making it possible to use offshore as well. The Simrad NSS7 evo2 Combo Multifunction Display Insight includes lifetime tech support and all of the same features found in the Lowrance Elite-9. Unfortunately, it does not have the touchscreen feature, but it comes with a added stand, making it possible for you to use it for offshore fishing as well. The price is not too expensive when compared to the elite-9 and the GPS system is highly accurate. The Humminbird HELIX 12 Chirp DI GPS Fishfinder is a little more expensive, but it does have a 12.1-inch display. It features a dash mount that can be easily removed if it is not in use and the 3 programmable buttons make it easy to navigate the system if you need to change the settings. Compared to the Elite-9, it does seem a little overpriced. Finding a quality high-end fish finder is not always easy and sometimes, you might even be let down by some of the flaws. However, the Lowrance Elite-9 Ti certainly aims to break this trend and while it is still not the best for saltwater fishing, you will not find much better for fishing inland. It has all the features one would be looking for in a top-rated fish finder and should be a great purchase if you are a serious angler. 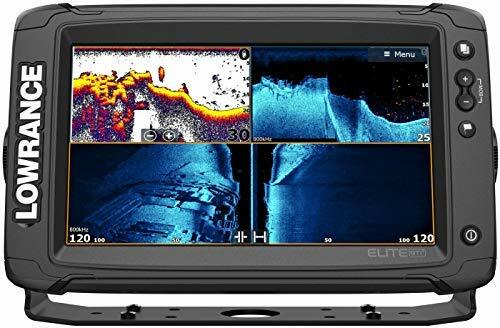 Fishing Tech gives the Lowrance Elite-9 an overall rating of A+ and we would highly recommend it to any serious or avid angler looking to get great value for their money.